Do You Have a Stressed Dog? Puppy Dog Stress: This dog is yarning, a sure sign he is stressed and trying to calm himself down. We all know what stress looks like in people but how does stress in dogs appear? Dogs experience stress also, but the ways that stress is exhibited may be slightly different than in people. It is a regular part of everyday living and can be either positive or negative. When stress is positive, it keeps us motivated and alert to avoid danger (Fight or Flight reaction). When it is negative, though, it can affect our health and wellbeing in many different ways. What Factors Contribute to Stress in Dogs? You can often tell just by the surroundings or what is happening that your dog is stressed. Here are some of the ways that may stress a dog out. 1. Sudden changes in the environment or routine can put a dog at risk for stress. This can include taking a new job with more hours, having a house guest, or a regular person in the household moving out, or going away to college. 2. Always being disturbed. Dogs need their space and their rest time. This is often a problem in families when active children are wanting to play with the dog. 3. Overexcitement. Even too much of a good thing such as play, too many dogs, overstimulated can be stressful. 4. Scary situations. This varies from dog to dog but some dogs are more fearful than others. This could be anything from a trip to the vet or a hike in the woods. Some dogs hate crowds and others find dog parks to be stressful. 5. Being alone. Dogs are naturally pack animals and are not keen on solitary confinement. Separation anxiety is pervasive in small breed dogs. 6. High noise levels. Barking is typical in animal shelter situations but loud noises can happen at home with music playing loudly, or power tools running. Fireworks, gunshots or thunderstorms can be very loud and cause stress in dogs. 7. Illness When a dog is sick, he is also likely to be stressed by his uncomfortable symptoms. Itchy skin, pain, GI disturbances, seizures and other symptoms are going to cause stress in dogs. 8. Temperature extremes. Too hot or too cold (Some breeds do better in the heat, others tolerate cold well, but dogs will become stressed if required to endure extreme temperatures. 9. Potty Breaks. Well house trained dogs may become agitated, frustrated or stressed when they can’t go to their regular pottying spot when needed. 10. Hunger or Thirst. When food is not provided frequently enough or not on a schedule, hunger pains result. When the water bowl runs dry, dogs get anxious. Dogs should be fed twice a day and freshwater should be available at all times. 11. Too much or too little exercise. Here we borrow the Goldilocks Principle. Not too much, not enough, but just the right amount keeps dogs happy. This varies from breed to breed and dog to dog. 12. Training often stresses dogs especially when harmful methods, extended sessions or too many demands will make dogs stressed. Even well trained dogs may be stressed out in group training sessions. 13. Harsh leash training. Pulling, jerking, or pushing dogs will not speed up the process of learning to walk on a leash properly. Treats, positive encouragement, and a gentle approach will work much better. 14. Direct threats such as violence, anger, or aggression in the environment can especially if it is ongoing can lead to chronic stress. Loud arguments between family members, physical abuse or any other violence whether directed at the dog or at the humans living in the house is extremely harmful to both dogs and humans. 15. Visits to the Vet can cause stress in a number of dogs. No matter how positive the visit might be, some dogs get stressed the minute you pull into the vet's parking lot. Shaking, trembling, refusing to walk through the door are common occurrences to many small dog owners. 16. Grooming can cause stress in some dogs and can occur during bathing, brushing, clipping, nail clipping or during any other grooming activity. For dogs that need regular grooming, the stress that accompanies it can be frustrating to owners and may prevent them from doing what they need to do to keep their dog looking great. Professional groomers may demand tranquilizers to adequate finish the groom. We all can identify many of the symptoms of stress in our own dogs such as shaking or trembling, wanting to turn away or hide, or constant barking. 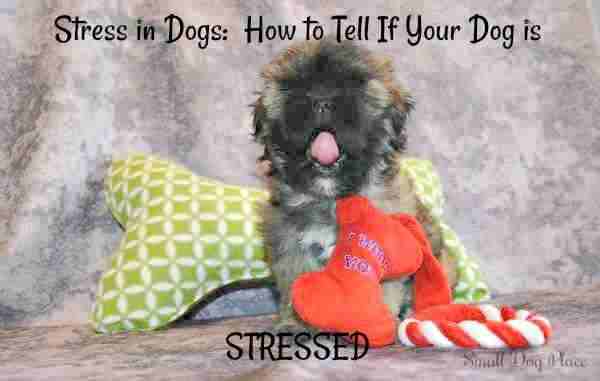 But what about some of the less obvious signs of stress in dogs? Top Dog Tips identified at least 20 signs of stress in dogs. Some of these signs may indicate other problems, but if you begin to notice more than one symptom at once, stress may be the problem. When your dog is stressed out, he’s not likely to eat very much or not at all. This can be seen in boarding facilities especially the first couple of days. Stressed dogs will sniff but refuse to eat until they become acclimated to the new environment. This same response can happen when you leave your dog with a friend while you’re away. Turid Rugaas, author of On Talking Terms with Dogs: Calming Signals, identified many of these behaviors that dogs exhibit when they are trying to calm themselves down. Lip licking, yarning, walking very slowly, turning his head away, blinking his eyes, and sniffing the ground especially when another dog is approaching are all ways dogs can reduce stress and calm themselves down. We’ve all experienced “butterflies” in our stomach before a stressful event and some people experience upset stomach or actual pain. Dogs are the same way and GI symptoms may occur when the dog is under stress. Digestive disturbances can mean other things, but suspect stress if these GI problems accompany other signs of stress. Have you ever noticed your dog shake as if he were wet when you put him down after grooming? This is another way to calm himself down if the grooming was stressful. Scratching, blinking, chattering teeth and nose licking are more signs the dog is trying to relieve his stress. Experts call this shaking or trembling "displacement behaviors," and they can be a sign of stress in dogs. Excessive licking such as on a paw or groin area may signify stress in dogs. Some anxious dogs lick a paw to the point of making it red, inflamed or even breaking the skin. Naturally excessive grooming can have other meanings just like most of these symptoms. Please don't take one to indicate your dog is stressed. Ever see a lion pacing in a small zoo enclosure? Dogs do the same thing and stress may be present. Dogs may run up and down a fenced in yard when someone passes by. This may look like the dog is excited but it could also indicate stress. Clingy behaviors indicate your dog wants to be near you. They are looking to you for reassurance. A small dog that is holding onto you with both front legs is feeling nervous and will cling to you for comfort. This is a typical reaction that tells you immediately that your dog is stressed. You may often see this when a new dog approaches your dog. Slinking, or cowering could mean your dog is experiencing an uncomfortable situation. Some dogs will cringe if you scold them in an angry voice. They don't understand why you are mad, but they do understand that they are uneasy. Other dogs will lie down on the floor as a way to calm other dogs when they are too rambunctious. You may notice this in multiple dog households or when a puppy is introduced to an older dog in the home. Some dogs like to put things in their mouth. Others insist on carrying a soft toy around in their mouths. Some dogs even prefer your hands. This last one can include a gentle nibbling, a painful nibble, snapping, or even biting. Mouthing is common in puppies as they teethe but most dogs figure out that human hands are not to be bitten. If all of a sudden, your dog develops a mouthing problem, watch for other signs of stress as mouthing can mean your dog is stressed. If your dog is panting or breathing heavily when physically inactive, you are observing one of the more obvious signs of stress in dogs. Panting without exertion means something is not right and you as the dog parent should try to figure out what is stressing your dog. The paw pads are the only place on a dog that contains sweat glands. Just like we may get sweaty palms, dog experience this same reaction when stressed. The first time I observed this phenomenon was when I was trying to trim my dog’s nails and I found the hairs between his paws to be very wet. Searching for a place where she might have walked in something wet, I soon realized she didn’t like having a pedicure and was showing signs of stress. Chronic stress can cause an increase in shedding. All dogs shed, but when they are stressed they will show less hair and a scrappy appearance. If it isn’t the season for shedding and you are finding more hair around your home, chances are something is not right. Destructive behavior is a very common symptom of separation anxiety. Ripping pillows, chewing or biting on furniture, or digging their way through your sofa cushions are all symptoms of stress. This destruction is a way for dogs to reduce their stress level. Some dogs may even try to hurt themselves by pulling out hair or chewing on themselves. You’ll know your pooch may be stressed when sniffing the ground or floor is taking precedence over normal activities. Many dogs will sniff the ground when another strange dog is approaching. A stranger approaching may also elicit this behavior. You may also observe this behavior if you stand over your dog and you are speaking in an infuriating tone. Accidents in the house by well-trained dogs could indicate something is amiss. It can also indicate other things as well such as a health issue so it is important to look at the whole dog and your situation to determine whether these accidents could be an emotional reaction or a symptom of a health problem. This behavior is easier to notice on some breeds but when dogs that do not normally hold their ears backwards and low began to show this posture, something is normally wrong. Cowering or a lowered body posture often accompany pinned back ears. If your dog is sleeping more than is normal he could be stressed. Extra naps may also indicate your dog is not getting the restful sleep he needs especially at night. He makes up for lack of sleep by sleeping during the day. Lack of sleep can also cause stress, so it is a never-ending circle. The dog who normally doesn’t bark is now whining, howling or barking. More vocalizations often indicate problems. This is especially true if barking continues for extended periods of time, or you notice that barking lingers over days or weeks. Once you have determined that there is not a cause for the barking such as a jogger passing by, or a squire close to the house you can assume that something is stressing your dog. Just like people experience physical problems such as high blood pressure or a rapid heartbeat, stressed dogs can show new symptoms such as allergies, or upset stomach. Chronic stress also lowers our ability to fight off infections and a compromised immune system means your dog is susceptible to new health problems. A good example of this is coccidia, a parasite that is present in many dogs but lays dormant in the GI tract until they experience stress. Our dogs will get stressed from time to time, just as humans, but the good news is that we can help reduce this discomfort and for the most part, the interventions are easy and cheap. Remember that stress in dogs can be situational and short-lived or more pervasive. This is easier said than done, but if you feel yourself getting agitated or angry at your dog, stop. Your dog will be stressed if you are stressed and there are plenty of coping mechanisms that people can use to reduce stress in their own lives. Try calming yourself by relaxing all the muscles in your body. As you become relaxed watch how it affects your dog. When your body is tense, your dog is tense. Do both of you a favor and try to be mindful of when tension crepes into your own muscles. 2. Examine your training methods. Harsh, punitive training is not effective and can cause stress for your dog. If you are in a training program that uses these negative approaches, quit and find a better solution. If you see yourself getting upset when your dog does not do as told, stop the training session and resume when both of you are calm. Avoid putting your dog in a situation which you know will cause stress. Sometimes this is unavoidable such as during thunderstorms or fireworks displays. These are temporary events that while stressing your dog, they won’t leave lasting problems. Deal with these issues using calming techniques. Your dog should be part of your pack so spend as much time with him as possible. Too much alone time is not suitable for dogs. Find ways to include him in family activities. Avoid temperature extremes, either hot or cold. What is comfortable for people will be conformable for your dog. Jogging at 110° temperatures is not a good idea and leaving a dog outside in very cold or sweltering temperatures will likely kill him. Find a good average from too much to too little exercise. Each dog is unique so this amount will need to vary from breed to breed and dog to dog. Brachycephalic breeds such as Pugs and Shih Tzu dogs may only last for a casual stroll around the block. More active breeds will not be satisfied until they've walked a mile or more. Touching, massage, gentle brushing, and scratching are all things that dogs love and will benefit both of you. Being close to your dog will reduce your pooch’s stress and will have health benefits for you too. Learn to communicate with dogs. They don't have language but they are very effective in communicating both with you and other dogs. To communicate you must learn to read their body language and understanding when they are using these calming signals to reduce their stress. Think how stressful it would be if you were trying to communicate but not be able to get your message across. Dogs must feel that stress when they try to tell us something and we either don't understand or ignore their needs. Determine what is causing the stress and remove it possible. Dogs like to have a place where they can rest or sleep and know they won't be disturbed. A crate or comfortable dog bed fulfills this need. Many dogs will visit their crate throughout the day for a short nap, provided that the door is open and kept open for them to enter and exit. Almost any parenting class or book will tell you that consistency is one of the best ways for parents to build trust, eliminate challenging behaviors, and create a lasting bond with their child. Dog parents should take heed. Dogs thrive on consistency too. A predictable schedule, a familiar way of doing things, and an orderly household will help your dog learn the rules quickly. When dogs know what to expect, they are less likely to be stressed and act out in ways you may not approve. Don't allow us to be the cause of the stress in dogs. Some dogs respond to soothing music just as humans. In fact some music has been shown to calm an entire group of dogs confined in a Shelter or kennel situation. Not all music is the same though, so finding the type of music that can help is critical. Just by the shear number of anti-anxiety, calming medicines and products on the market today, one can correctly assume that our four legged friends are suffering from as much stress and anxiety as people experience. If your dog is showing signs of anxiety or stress, either due to a specific situation or in general, they may benefit from some of the calming products available today. For more severe problems, a veterinarian should be consulted as there are also prescription medications that might be helpful. Here are a couple over-the-counter medications that you might try to help your dog relax. These bite sized chews are good for dogs that hate car rides or visits to the vets. They also work well during thunderstorm or firework displays. For those who groom their dogs at home, you can give these 30 minutes before you begin and increase the dosage if you aren't seeing the calming effect you desire. This product uses vegan non-GMO organic hemp grown in the U.S. You can purchase this as an oil that can be dropped on food or as a chew, whichever works best for your dog. It is good for separation anxiety or can promote an over-all calming effect for anxious dogs. Good for joint health too. Please include attribution to TopDogTips.com with this graphic.